You heard that right. Trix. 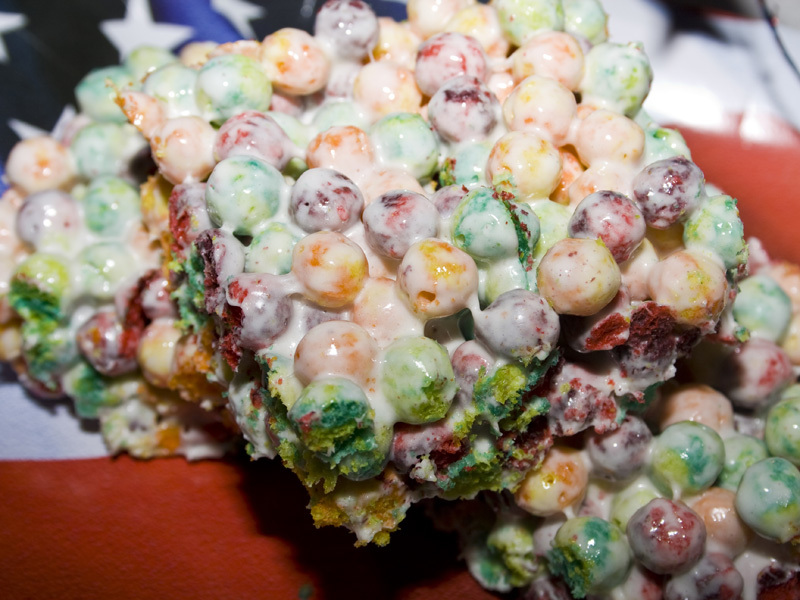 Krispies. No I am not kidding. Yes, they are as incredible as they sound. 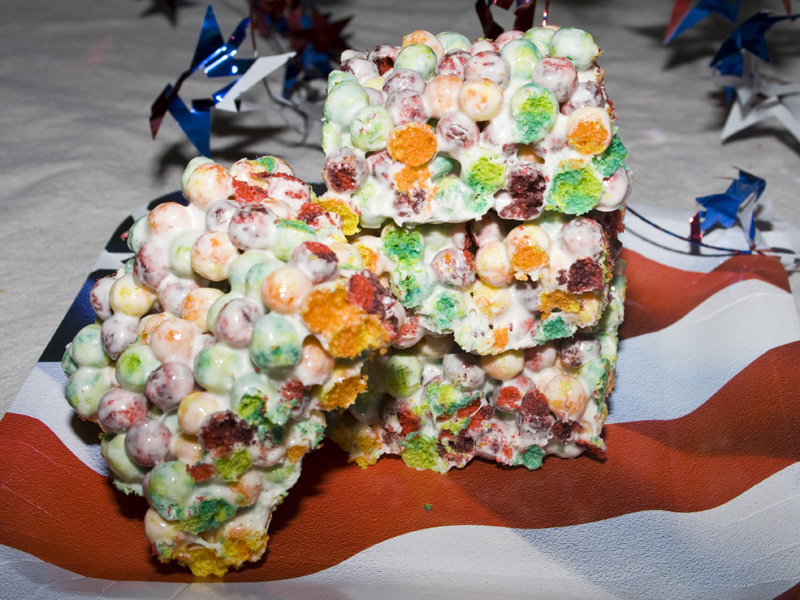 Now, I have to admit, I have not tried the various other krispie recipes I’ve seen around lately. Making them anyway. I’ve certainly consumed my fair share. It is all the rage to do outrageous things to rice krispie treats and several of my friends have brought different batches around for me to taste. I haven’t gotten in on that action for two main reasons. First, I love my recipe for the original rice krispie treats. They are incredibly gooey, perfectly rich and delicious. I cannot imagine a more perfectly easy treat. Second (and the “real” reason for not branching out), every alteration to the original seems to add gluten into the mix. Cake batter treats are delicious, but my Celiac sister and her gluten intolerant family cannot eat them. 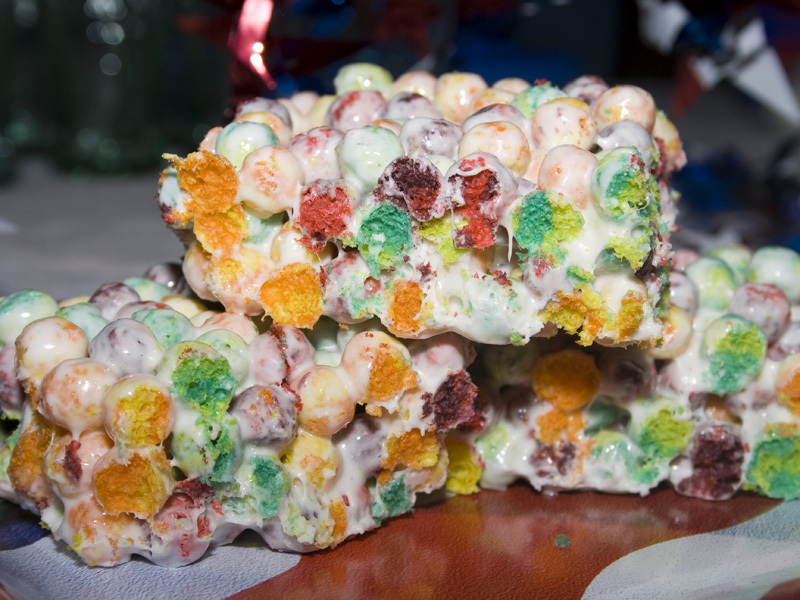 I’ve even seen a recipe for Lucky Charms treats that look very yummy, but again, it makes it hands-off for lots of my family members. With so many things already off-limits, I just didn’t feel right taking away the stand by good-for-everyone dessert. Then I saw this genius idea for using Trix. Did you know that Trix are made from corn? Yes. Corn. Not wheat. Delicious, fruity corn. Non gluten, beautiful, colorful corn. Silly rabbit! These Trix are for everyone! 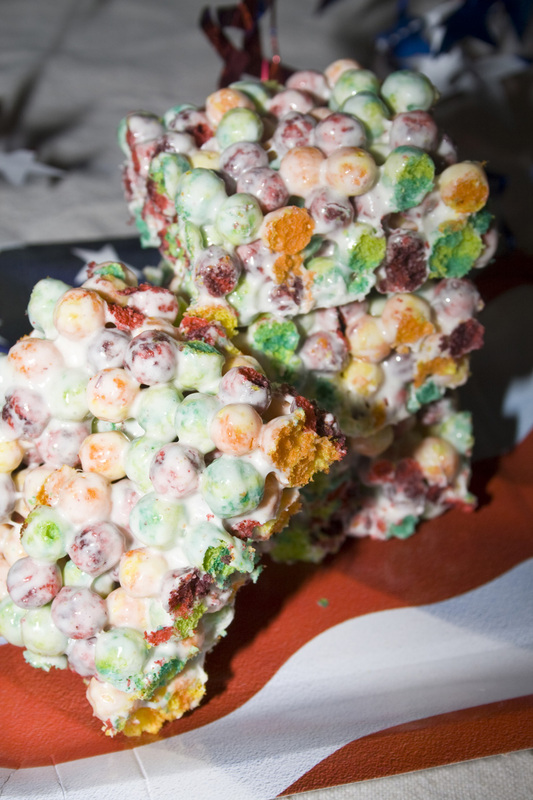 I adapted this recipe to use a whole box of Trix and one bag of marshmallows. Why waste the little extra bits of either bag? 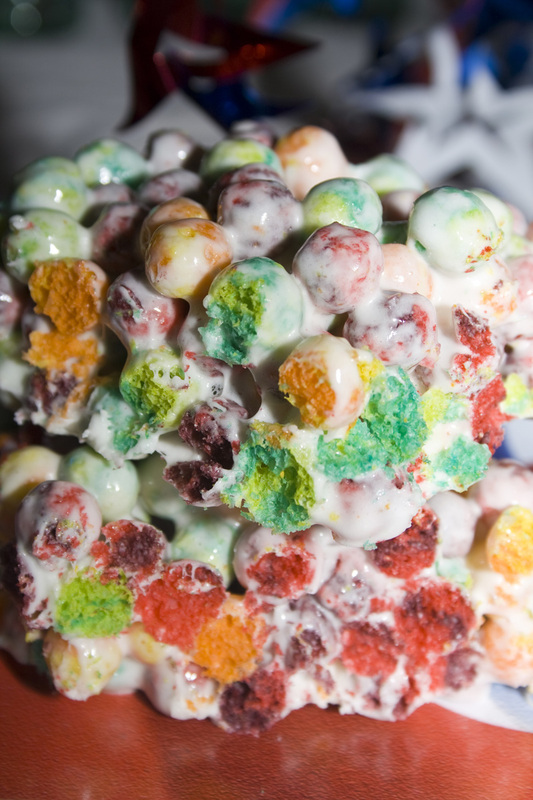 Trust me, once they are combined into these amazing krispies not one little fruity ball will be left over. I cannot begin to tell you the deliciousness of these. Truly. Like a bar version of fruit with a marshmallow dip. And, just looking at them makes you happy. That rainbow of colors winking out at your from beneath a layer of gooey butter marshmallow. Yuuuuuuuum. Melt butter slowly in the microwave (I do this on half power). Once butter is just melted, add marshmallows and continue microwaving about 2-3 minutes, stirring frequently until mallows are melted. Mix in your trix and stir. Pour into a large greased pan (9 x 13 or 11 x 11) and press down with a spoon. I use the empty butter wrapper to press my krispies into the pan. It’s already greased and won’t stick. You could also spray your spoon with non stick spray before using it.